It is 30 minutes before opening at Palo Alto’s newest fusion restaurant, Sun of Wolf. The three cousins sit in the far corner at a table that has yet to be set, their conversation muffled by the clatter of kitchen pans. They lean toward each other, gesturing excitedly as if exchanging secrets, recipes, plans for the night and everything in between. As the owners of Sun of Wolf converse, the candles on each table around them are lit and their restaurant comes to life. 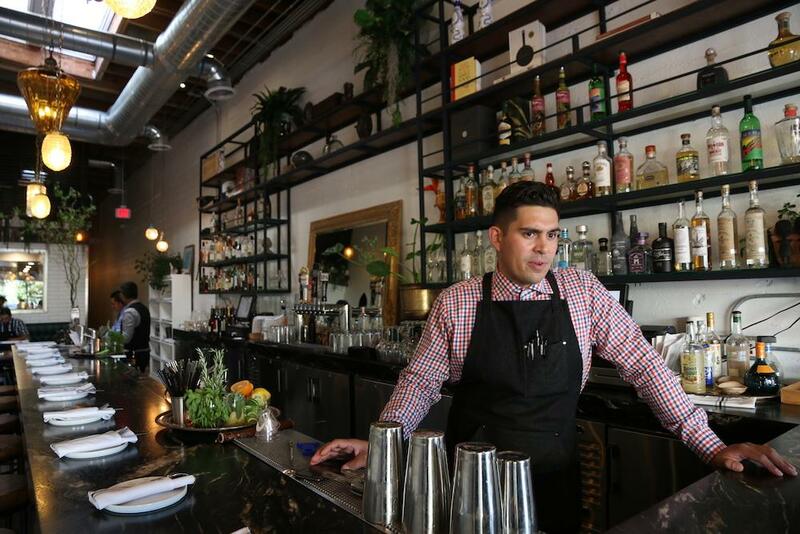 Two waiters, speaking in Spanish like brothers, laugh as they fold napkins, and a single bartender prepares his assortment of liquors on a polished silver tray. The restaurant’s building, situated at 408 N California Avenue, was originally meant to be an expansion of the Mexican restaurant next door, Palo Alto Sol. But when the city did not approve his request to expand his own restaurant the owner, Hector Sol, turned to his two daughters, Alexa and Paulina Sol, and nephew, Viari Lopez, and told them to create something of their own. From the beginning, the three cousins envisioned opening a bar. “In the midst of this tech, there are a lot of restaurants, but there is not a place that does super dope cocktails,” Viari says. But when the city pushed back again, allowing only a certain sized bar and kitchen, the three shifted gears and created Sun of Wolf. It took them one and a half years to plan and get permits, but in June of 2018 all of the planning paid off and the restaurant opened. As second generation Mexican Americans, Alexa, Paulina and Viari created a menu that combines their Mexican roots with their Bay Area upbringing. “When I would come back from [visiting] Mexico, the first thing I wanted to do was go to In-N-Out,” Alexa says. Inspired by their childhood, travels, family and heritage, it was difficult to fit their menu to just one category of food. So they chose not to. All of the recipes and cocktails were invented inside their mother’s (and Viari’s aunt’s) kitchen, where they would gather once a week to experiment with flavors and taste their creations. Dishes range from their grandmother’s lasagna to tacos crafted with handmade tortillas and infused with huitlacoche, a corn truffle considered a delicacy in Mexico. Paulina, the executive chef, studied at Le Cordon Bleu, and despite being vegetarian, has found unique ways to incorporate meat into the dishes and give traditional recipes a vegetarian twist. Though technically cousins, it is second nature for Alexa and Paulina to call Viari their brother. Viari can always be found behind the bar, mixing and serving cocktails to customers at the counter, Paulina spends hours before the restaurant opens prepping in the kitchen. The interior design of the restaurant, much like their menu, is not defined by any one style. The space soaks up light, its white walls brightened by a myriad of hanging lights. Inspired by the lively altars created on the Day of the Dead — a Mexican celebration meant to honor and remember family members who have died — small niches indent the walls of the restaurant, each holding eclectic objects from the cousins’ travels around the world. “I wanted to create little mini altars inside of the restaurant and have that culture be part of it,” Alexa says. The large window in the back of the restaurant frames the action happening within the kitchen, and at a closer look, is adorned by a curious assortment of statues. The Buddha and the Virgin Mary sit next to each other, each making the same gestures. “I wanted everybody to be able to find themselves in the restaurant,” Alexa says. The essence of the restaurant is to create a space where people can convivir, which literally translates to “live together.” But to the three cousins, it also represents the strength of community and the importance of family. The restaurant’s name, Sun of Wolf, encapsulates this idea. The roots of each of their last names, Sol and Lopez, directly translate to “sun” and “wolf.” However, the meaning goes beyond that. The wolf represents the family pack; for the strength of the pack is the wolf, and the strength of the wolf is the pack. Golden Dragon – “I saw it on a netflix show,” Viari says. “A South African bartender was working with gin and juice … we mimicked it but made it different.” Their drink only contains four ingredients: gin, lemon, sambuca, and simple syrup. Their tortillas are hand made everyday, something you won’t find in many restaurants. Huitlacoche, a corn truffle considered a Mexican delicacy, is added to the masa. Their tortillas are added to their duck confit tacos or can be ordered as a side dish.